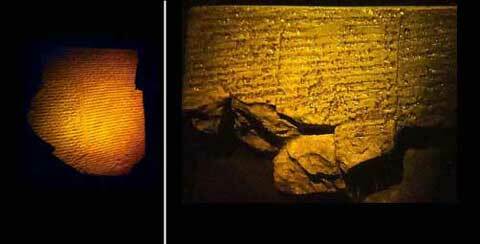 Lasers record 3D holograms of various artifacts discovered on Mt. Ararat during a famous expedition to find the real Noah's Ark. "Maybe I will not live up to that time, but you will hear talk about the events I lived on Ararat. Remember always that Noah's Ark is not a myth. I saw it myself and these hands touched it. Remember very well that it is on Mount Ararat." -- Batov Fedor Frolovich to his grand daughter (alive and located), concerning his Tsar Nicholas II sent trek up Mount Ararat during the Armenian summer of 1916. Allentown, Pennsylvania: On Thursday, January 28, 2016, a private plane landed at Lehigh Valley's Queen City Airport. It was carrying one of the rarest artifacts in the world today: wood purportedly from what remains of Noah's Ark on Mount Ararat. 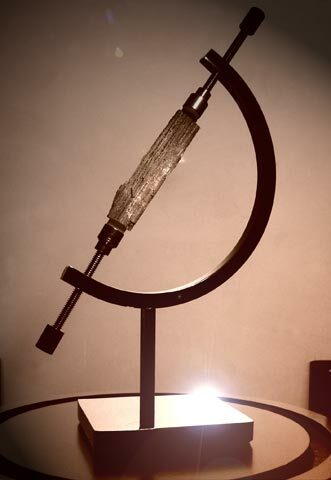 For many, it is considered one of the Holiest relics in all of human history. 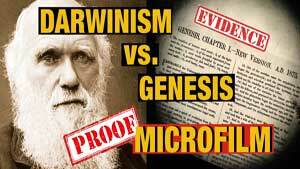 It was brought to Allentown, Pennsylvania from the Creation Evidence Museum in Glen Rose, Texas (LINK). The museum was founded in 1984 by director Carl Baugh for the purpose of researching evidence and displaying exhibits that support the Biblical creation. (photo above): One of the rarest artifacts in the world today: Petrified and resin coated tooled wood from the top of Mt. Ararat. (photo above): Shooting test holograms in the studio / lab in preparation. I should mention at this point that there have been numerous expeditions over the years (even centuries) that make claim to various sightings of Noah's Ark in several locales. Some are legitimate, others innocently questionable, with a few being outright fabricated deceptions. Also, as a side note: some like to point out that the Bible states in Genesis 8:4 "...the ark rested in the seventh month, on the seventeenth day of the month, upon the mountains of Ararat" (KJV). They point out that "mountains of Ararat" does not mean "Mount Ararat" proper. I am fairly certain (correct me if I am wrong) that "Mount Ararat" proper (Agri-Dagh / Masis) is PART of the 'mountains of Ararat' and, therefore, no reason for disqualification when pointing out the plural. The expedition(s) of the SEARCH Foundation team(s), a dedicated group of Christians, seem to me to be very trustworthy. It is with this trust and honesty of both the 1969 exploration group, and also the Creation Evidence Museum, that I took on this project. The group of five arrived at my private holography studio (LINK) on Friday, January 29, 2016. The team included Dr. Carl Baugh, Creation Evidence Museum of Glen Rose Texas (LINK); Dr. James Scutter and his son Pastor Jim Scutter, Jr., of Quentin Road Bible Baptist Church (LINK) and Dayspring Bible College and Seminary (LINK), Lake Zurich, Illinois, and two flight crew members. 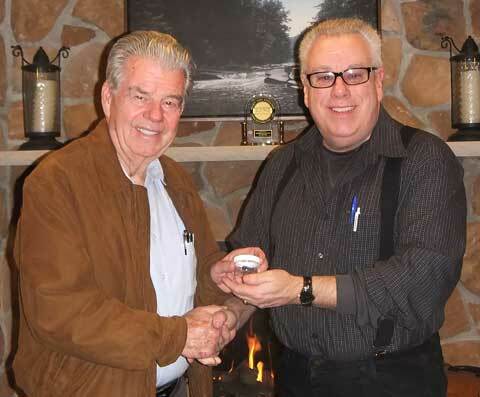 (photo above): Dr. Carl Baugh (left) presenting a cut segment of wood to me (Frank DeFreitas, right). Only a handful of people in the world today have a piece of what is believed to be Noah's Ark, found on the Mount Ararat expedition. We all enjoyed an informal dinner together the previous (Thursday) night. It was during the dinner when Dr. Baugh surprised (shocked) my wife Deb and me with a most unexpected gift: a piece of the Noah's Ark wood for our collection. It had been cut off the main piece by a specialist in Chicago. 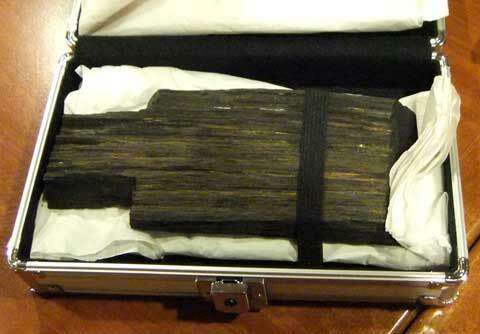 Dr. Baugh stated during his presentation that "only a very few people in the entire world have been presented with a cut of this Ark Expedition wood". It was a great moment of honor. Then, upon arrival at my holography studio, the main piece of wood was recorded as a series of three dimensional laser images called holograms / archeolograms: the first laser holograms in the world to be made of ANY sample returned from ANY Noah's Ark expedition. Due to the nature of holography, it will now be possible to make the Noah's Ark fragment available to people here in the United States, as well as in far off lands ... including those who would never have the opportunity to ever experience it otherwise. The vast majority of people living throughout the world today do not have access to museums. Hard to believe, but true. With holography and three dimensional holographic imaging, we can bring the museum to people ... while the object remains safe and sound at all times. Also, since it is a three dimensional hologram, copies of the hologram can be placed under a stereo microscope, and examined in three dimensions -- as if the object itself were really there. This opens research opportunities that were never before possible. (photo above): Wood from Noah's Ark is held in place and illuminated with laser light for its 21st century holographic recording. 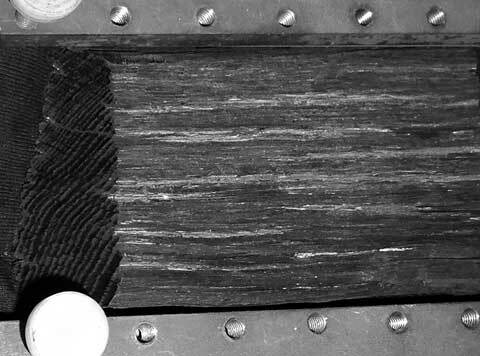 These planks of hand-tooled, pitched (Hebrew "kaphar" : to cover : atone) wood timber were found at 14,000 feet above sea level on Mount Ararat in Turkey (for comparison, Mt. Washington in USA is 6,288 feet above sea level). The total height above sea level for Mount Ararat is 17,820 feet (5,430 meters). It covers over 500 square miles. It has canyons twice the depth of the Grand Canyon. It has the largest ice cap in the world: nearly 20 square miles of ice, 300 to 800 feet thick. There are no trees at that elevation. The type of wood is not found growing within 300 miles of the site. The wood samples have been chemically tested and shown to be sealed with pitch (the pitch plus the encasement in ice preserved the wood). Every year 15 feet of snow falls during a nine-month period. Then, during the summer months, much of it melts. Its calculated encasement size has been reported to be "as long as a city block". 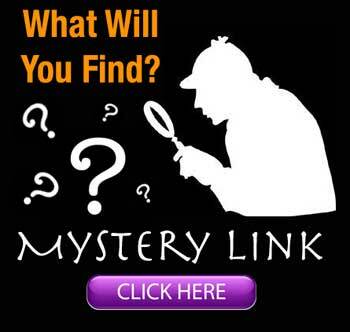 Some reports have it located in several places and in several pieces. Most likely, no one will ever come across the ark remaining as it was built. Any where. Any time. Several recent findings (including penetrating satellite radar) suggest that the ark is broken into several large pieces, and encased in snow and ice at an elevation of 15,000+ feet. Other smaller pieces of ark wood, untold in number, are scattered throughout the mountain below, carried, broken and splintered by the crushing movement of glaciers. If Mount Ararat is truly its final resting place, then thousands of years of storms, glacial movement, thermal cycles, and even earthquakes have rendered it completely torn apart. It is estimated that there could be 50 tons of hand tooled timber, many pieces up to 150 feet long, in this area of the mountain. Nearby it is reported that there is a 75-foot-wide, 65-foot-high ledge, about 4 feet thick, made up of tons and tons of fish, snails, crabs, clams ... all petrified but perfectly preserved. May I restate that these aquatic fossils are found at 13,800 feet above sea level. Now, there are those that say that it is possible for large quantities of wood to have been taken up the mountain, and planted there to make it LOOK like the expedition wood came from Noah's Ark. Don't believe it. The environment of Ararat at 14,000 feet is raw, unpredictable, wild, dangerous, sometimes deadly, to a degree that is unlike ANY thing that we know of in this world. Each day. Every day. Year round. Its enough just to get yourself up to that level, let alone haul estimated tons of fossilized lengths of pitched wood. No, I do not think ANY one hauled all that wood up to the summit of Mount Ararat, let alone built a reportedly enormous vessel / structure up there ... encased in glaciers, no less. One would be wise to also remember that finding wood at great elevations on Mt. Ararat is not a recent phenomenon. Explorers have been returning with wood for over a thousand years. The Saint Hakob of Akori Monastery, founded in 341 A.D., was said to have contained relics of wood from the Biblical Ark of Noah. The Monastery was totally destroyed during the famous earthquake of 1840. The earthquake also destroyed entire villages, and upwards of 10,000 people were killed. A volcanic eruption from the northern slope of the summit also accompanied the quake. There is also the Cathedral Of Echmiadzin, constructed in 309 A.D., which houses a Noah's Ark reliquary containing wood found on Mount Ararat in the 13th century. It has been reported that this wood in particular has been carbon dated to 6000 years old. It remains on display to this day. Dr. Baugh himself was part of a Mount Ararat expedition team from USA in 1990. During this time, fighting broke out between the Kurdish rebels and the Turkish military and the authorities were very concerned for their safety. After they had climbed to the high camp from the south side of the mountain they were ordered to get off the mountain, and thus had to discontinue their search. 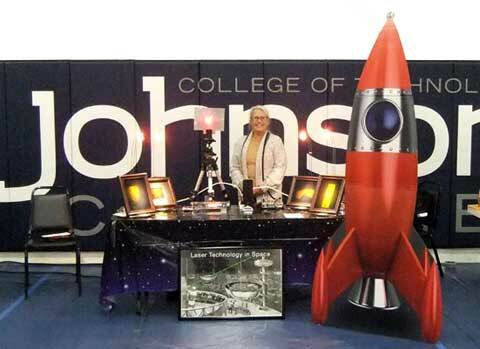 (photo above): Exhibiting ancient Biblical archaeology laser holograms at Johnson College of Technology in 2015. Showing how laser technologies can bring our Biblical heritage into future space colonizations. We transmitted Genesis 1:1 via free space laser communication during this presentation. The hair-trigger political and military situations that continue to crop up, even today in 2016, is one reason why access to the mountain is restricted and controlled ... at least for professional scientific level exploration. Some feel there are people in powerful positions who do not want discovery at all. Fortunately, in 2016 we now have the technologies readily available for making proof-positive identification, such as satellite controlled drones (and I'm not referring to "hobbyist" drones, I'm thinking more along the lines of heavy-duty, military-scale drones to withstand the extreme conditions surrounding Ararat). Add laser holography (which happened via this project), along with other emerging three dimensional imaging technologies, and any physical evidence can be made available to anyone on the planet (literally) -- in ultra-resolution 3D. The Bible tells us that the Ark came to rest in the mountains of Ararat, historical documents have confirmed it via eye witness accounts since the times of ancient Chaldea and Assyria. It has only been recently -- just as the much-needed assistive technologies were becoming available -- that the rug got pulled out from underfoot, and exploration(s) came to a grinding halt. Will the pendulum begin to swing back in a new direction? What goes around comes around, and the time has come again. (photo above): Actual image of Noah's Ark laser hologram (detail), reconstructed with amber LED light source. I must say that after spending 30+ years making laser holograms right here in my studio / lab, that this hologram is unlike any other. There is something very unusual about the image. The reconstructed holographic image is somewhat 'luminescent'. In other words, there is a play of light (either on the surface, or directly above the surface) that moves when one changes their orientation to the hologram (or by holding the hologram and moving it). In the still photo above, it is seen as a horizontal bright area. This bright area moves around (on the hologram in person, not the photo here). I would make a video, but it is not going to show 3D depth. I am trying very hard not to use the word 'halo' as the description ... considering the Biblical nature of the object recorded ... although it is by far the most accurate description that I can think of at the moment. I didn't notice this until it was matted and framed, so I did not have an opportunity to compare my own hologram to those that followed it (my hologram is the test image, shot before the 'main' images were exposed). The time went so fast in the lab, it was like a blur. I also did not take notice to the wood itself as it was bathed in laser light. For those who will have a chance to see the hologram in person, it will be definitely something to look for. I will be curious to hear others' take on what it is that they are seeing with their own eyes. (photo above): A very small splinter of Noah's Ark wood is shown under the microscope. A laser hologram of this splinter would work just as well as the original piece -- even showing depth and dimension under a stereo microscope. Thousands of holograms could go to thousands of researchers around the world. The schedule for the day of shooting was very tight. We shot a total of nine holograms, of three separate objects, within a very short period of time. Each of the three objects had to be arranged under the plate holder, and have an original test shot to get a sense of lighting. Then the same would take place with the other two, each time making any necessary adjustments for each new object. Fortunately, we were shooting onto photopolymer recording material, so darkroom chemical processing and drying were not required. Only ten plates remained out of two original boxes of six, since I performed two test shots adjusting the optics table several days before. There was no room for error, and the pressure was on. Out of ten shots, nine were good. One right after the other, one object after another. Prestissimo! Each was acceptable as display quality. Keep in mind that six people were down in the lab. That's a lot of thermal energy that six bodies throw off in a small laser lab. If you have ever worked with holography, you know that thermal interference can throw a monkey wrench into any shoot. Not to mention the concentration that is required when working with objects estimated to be worth tens of millions of dollars. 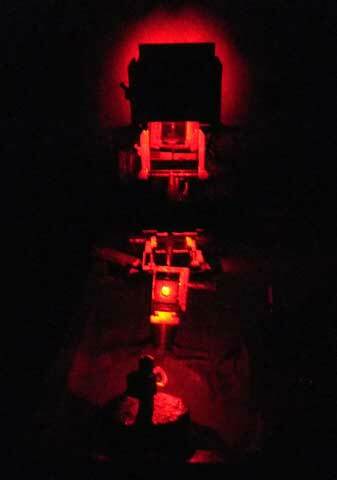 We were thankful each time a shot was completed and held up under the light for inspection. The photopolymer recording material was supplied through Liti Holographics (LINK). Also included in the days' holographic recordings (among others) were two 24 karat gold amulets, written in Greek, and dating back to 64 A.D. It was fascinating to learn not only about the text, but the symbols used as well, many bearing evidence of the early Christian faith. The first amulet had written "I Pray the Exceeding One whom John declared that one I will see", and the second read "Through the year of the raging waters of Noah the King roared." Each amulet has been appraised at the value of $30 million dollars (US). 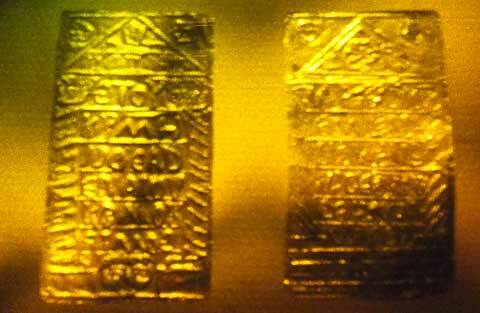 (photo above): Actual image of early Christian amulets laser hologram (detail of test image), reconstructed with amber LED light source. 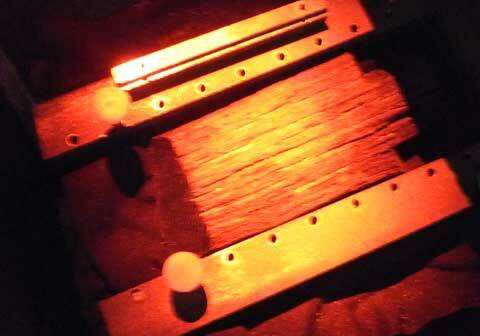 (photo above): Wood from Noah's Ark is held in place for laser holographic recording. Note grain. Science is never settled. But the Word of God is. It is always good practice to remember that consensus among scientists is not always a valid criterion for evaluating a scientific claim. To get a good example of that, just type: "scientists previously thought" into any search engine. You'll quickly see how often scientific 'facts' fall by the wayside, only to be replaced by the newest findings. After all, that is the way science 'works' by its very nature. 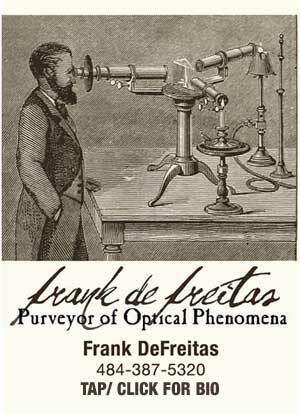 Today's diode laser / pointer holography is a case in point: a new era of 21st century holography that I personally helped usher in with two others ... against all conventional 20th century holographic "expert" wisdom of the day. The debate with diode lasers is now closed, thankfully, (and victory is indeed sweet), but the debate with Noah's Ark remains ongoing and, after all, I am a holographer, not an explorer. Do I believe that what remains of Noah's Ark is there on Mount Ararat? Yes, I do. Do I believe that there are those that want to hamper the truth that it is there? Yes, I most certainly do. Do I believe that this petrified, pitched wood in my holography studio/lab in Allentown, PA is from the Ark itself ... broken apart and brought down to the 14,000 foot level of Mount Ararat via freeze/thaw glacial movement over the past 5,000 years? Yes, I do. And the more historical research I conduct, the more I believe it to be true. The Ark is not symbolism. It is real. The global flood is not myth. It is real. Which leads me to mention that there has been much *truth* found in what have been previously discredited Biblical accounts. At an ever increasing pace, Biblical 'myth' and 'fable' is turning into hard historical reality. In regard to the Great Deluge (Flood), many people today have been (mis)led to believe that the Biblical account of the Genesis flood was "borrowed" from what is known as the Epic of Gilgamesh, and other ancient, non-Biblical flood stories / accounts from the Babylonians / Sumerians / Mesopotamians, including tablet III of the Atra-Hasis Epic. The ark described in Gilgamesh happens to be a cube. There are more recent news stories describing a tablet dated to c. 1850 B.C. that record the ark as being round. Since there were round boats used throughout the Babylonian region ("guffa") for millenia, this is a given. I just disagree that the Babylonian round ark flood account was the basis for the Biblical record of Noah and a world-wide flood. I do not believe that Noah built an ark that was in any way a variation of Biblical instructions recorded in Genesis. However, unless I'm mistaken (and I have the documentation here), the world's oldest known flood tablet is known as CBM 13532 (UPenn), or referred to also as CBS 13532. It was discovered in 1909 in Nippur, Mesopotamia, under the direction of Dr. Hermann Hilprecht. It purportedly dates from c. 2200 B.C. ... hundreds of years *before* the Gilgamesh and other discovered tablets (including the "Ark in the Round" tablet). It describes the world-wide flood and the ark, and it does so by being written only a short time after the actual flood itself took place (2348 B.C.). In this, what would be the earliest historical written record, not one translated detail varies in any way whatsoever from the Biblical account of Genesis. Of particular note is the fact that, unlike the vast majority of other ancient flood accounts, it lacks any reference to polytheism. Predictably, both the translation of the tablet by Hilprecht, and the date of the tablet, have been disputed since the discovery, and continue to be disputed today. The debate seems to have more to do with assumptions than it does evidence. After reviewing the written works of Herman Hilprecht, reading newspaper reports and court transcripts (which I have personal copies), I respectfully submit the following. I cannot submit it as an archaeologist, nor as a Biblical scholar. I submit it solely as an independent principle investigator of this laser holographic project. My conclusion is as follows: Those who have been convinced that the Noah flood story in the Bible was stolen from the Epic of Gilgamesh and various other Babylonian accounts have been grossly deceived by misinformation ... and possibly intentional misinformation. One must stop to ask, "cui bono?". It appears very convincingly to me that the more than 200 individual accounts around the world were actually taken *from* the Biblical account. The "main" details of all of the accounts are more similar than not (95% mention a global flood), with the smaller details added to each regional world-view of the day. One of the expedition members probably said it best years ago in a St. Petersburg Times newspaper feature story: "Either we must assume that some ancient people went to a great deal of trouble to hand-hew timber, haul them 300 miles over land, and carry them 14,000 feet up the side of a mountain in order to erect a building for some purpose; or we must conclude that a gigantic flood deposited a large, ship-like object on the mountain." There always will be those that look at things one way, and those that look at things another. When all of the available information is compiled, both pro and con, the existence of the Ark is not only the easiest explanation of all for me to believe, but it is the one that I choose to believe. (photo above): On Thursday, Feb. 4, 2016 we placed our Noah's Ark wood into its permanent display. We will be displaying this, along with the hologram of the larger Ark piece, throughout 2016 and beyond. IN CLOSING: When all is said and done, God does not want the world to believe through proof. God wants the world to believe through Faith. God has provided eye witnesses. God has provided physical evidence. God has provided forensic evidence. But God has not yet provided enough evidence to allow anyone to disregard the necessity of Faith. Through each of our God given talents, He has a purpose and a calling. For everyone. And that includes explorers climbing mountains, and holographers documenting artifacts with lasers. God will reveal what He wants revealed, within the timeframe in which He wants to reveal it.